Forbidden to learn. Forbidden to be free. Because they are girls. While this social media movement and the messages captured by it may never reach the intended audience, they will reach the families of the girls. The movement also raises awareness that will hopefully help continue the conversation among groups who are (or should be) working to find and rescue these girls. One year. It’s been one year, #DearSisters, since you were stolen away. One year of your childhood taken from you. One year of your parents and loved ones grieving the loss. One year of terror for you. #DearSisters, I think of you often. I pray for your rescue. I pray for you amid the abuse you inevitably endure. It’s a horrifying truth, but all too common among many sisters in the world. I pray you will find friendship and, somehow hope, amidst captivity. I pray for the people who know where you are. I pray they speak up even if they are afraid. I pray that among you there is a captor or two who has even a little doubt that this path of oppression is holy. I pray for a hero to rise up among the villains. I pray for the people trying to find you. I pray they always remember you, #DearSisters, and keep fighting until you are found and returned to your families. I pray they do not rest until your childhood is returned to you. #DearSisters, you are far away from me, but I want you to know that I think of you, I pray for you, and from my little part of the world, I am with you. 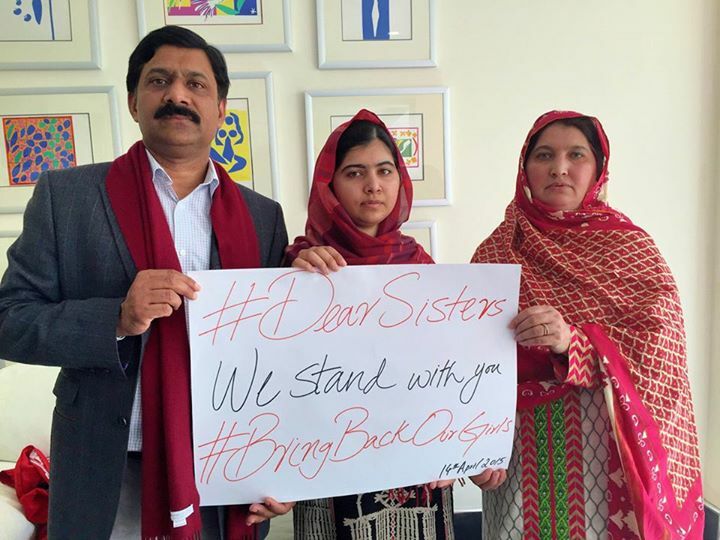 ***Visit www.malala.org/dearsisters to leave your message of hope and encouragement. The messages will be translated and shared with the families of the girls.